This weekend I decided to binge-watch David Attenborough’s breathtaking new series, Our Planet. Like its predecessors, it features impossibly beautiful footage of wild places from the frozen Arctic to lush rainforests and scorching African deserts, and exclusive glimpses into the lives of our incredible co-evolutionary kin. Only this time, the series’ tone is more ominous and its message more urgent, set as it is amid the planet’s sixth mass extinction event wherein we’ve already lost a staggering 60% of monitored vertebrate life per 1970 levels. A Palpable sense of loss pervades this new series, with frequent exhortations that we act before the loss of life spreads even further and irrevocably. What makes such loss particularly poignant is that it is the incalculable loss of cherished, irreplaceable earth kin who have been prematurely condemned to death due to our selfish and wayward actions. 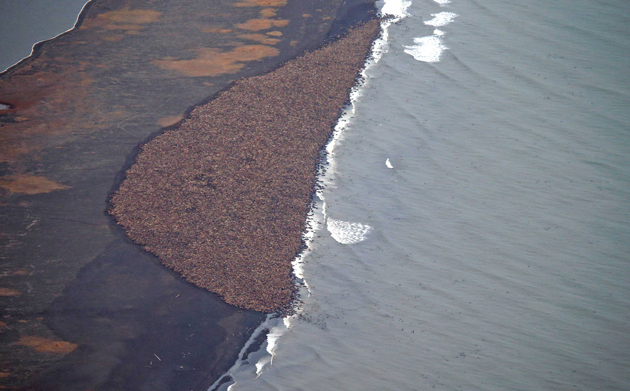 One particularly heart-wrenching scene in the series was simply too much to bear: that of walruses tumbling to their deaths after ascending perilous rocky peaks in a desperate search for resting spaces away from overcrowded beaches. Walruses depend on sea ice for resting, hunting, and birthing their pups. Yet with their former icy homes in the Arctic literally melting away due to anthropogenic climate change, they’ve been forced to flee in search of new ones on dry land. The image of the mighty walrus trapped at the edge of the rocky cliff, with nowhere left to go, is a fitting metaphor for our times: standing as we are at the precipice of climate and ecological catastrophe. More importantly, it’s a stinging indictment of our rapacious plundering of the earth to the point of altering timeless biogeophysical processes, and our ongoing inactivity as the consequences of our actions tear the rich tapestry of life asunder. When coming across the phrase ‘climate refugee’, perhaps images of human migrants fleeing their costal and/or low-lying island homes such as the Maldives and my own native Miami come to mind. And indeed, the World Bank predicts up to 143 million human climate refugees fleeing from water scarcity, rising seas, and crop failure in the coming decades- most of whom will hail from the Global South. Yet we too often forget that other species also suffer, often even more so, from the effects of a climate in disarray. The walrus and polar bear have become symbolic Arctic climate refugees, doomed species whose premature extinction we’re witnessing in real time. Polar bears, driven to starvation and desperation due to disappearing sea ice that is vital for them to be able to hunt, have been forced to invade Russian towns in search of food, where they face the additional dangers of conflicts with humans. They, like the walrus and countless species of flora and fauna now slowly migrating northwards to escape warming temperatures, increasingly have nowhere else to go. As I viewed (with immense difficulty) the scene with walruses tumbling down to their deaths from heights they never should have been forced to ascend, I experienced profound feelings of grief and species shame. Though culpability is far from evenly shared presently and historically, we as a species are all to varying degrees responsible for what’s happening. We have failed them. In our relentless expansion, and the disastrous consequences stemming therefrom, we have stolen their futures. Such powerful images should serve as wakeup call- that climate change and the wider ecological crisis are no distant threats but are already here and are worsening apace. The rocky shores strewn with the bodies of dead and dying walruses- consequences of our having monopolized the earth for ourselves alone (Bahro, 1994)- should serve as a powerful reminder of who and what truly matters, and stir us to immediate action. We can still effect a radical overhaul of our ways of life so as to make conditions as liveable as possible for earth’s inhabitants in the turbulent times ahead. Time is running out- for far too many, it already has.